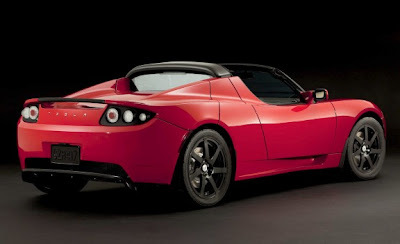 A blogger named Michael Degusta has widely distributed a link to the media publicising a blog post he authored about what he sees as a "Devastating" design problem with the Tesla Roadster. Based on hear-say from an as-yet un-named Tesla regional service manager (we are left to speculate if the source is another disgruntled ex-employee) Degusta recites several third-hand stories of Tesla Roadster owners who have bricked the battery pack in their cars by allowing it to run completely flat, the common denominator being that all these Roadsters were left unattended for multiple weeks. In one case the car was taken for a drive then parked with only a 25% state-of-charge (SOC) left in the battery, in a garage, unattended and unplugged for 6 weeks. In another case the owner left the car attached to an (unapproved) 100ft extension cord for an unspecified "extended period" again unattended. In a third case a Roadster was shipped across the Pacific to Japan, again starting with an un-known SOC and unattended for an unknown extended period of time. There are no claims of pending legal action against Tesla so we can take from that Tesla are not considered to be legally at fault. In-fact Tesla Motors have each new owner sign a document saying they have read and understand that the "warranty does not cover damage caused by leaving a vehicle unplugged where it discharges the battery to at or near zero state of charge". This document also specifies that "an extension cord should never be used". As much as it sounds like a possible design issue that allows the battery to brick itself, by all reports, it takes weeks for this to happen which squarely points to owner ignorance/neglect. Lets hope that the attention brought to this issue at least makes all Tesla owners fully aware that it is their responsibility to ensure due care of their battery. It should now be clear that if through negligence they allow their battery to reach zero charge and further allow it to remain in that condition for an extended period of time, then they are most likely liable for a sizeable repair bill.